Paco Díaz (Palma de Mallorca, Spain) on 4 October 2012 in Documentary & Street. 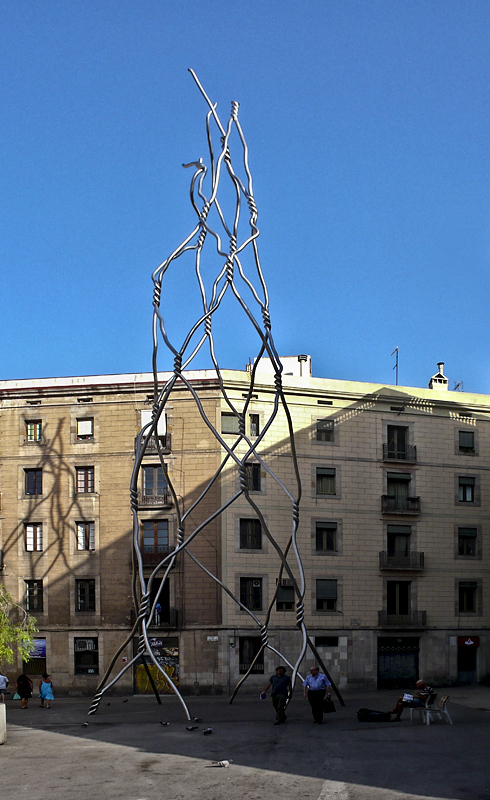 ¿Un doble homenaje al cava y a los castellers? De l'art un peu piquqnt! Sehr gut dieses Kunstwerk. Wunderbares Licht und Schatten. I feel I should not like this sculpture much . . but I do ! @Ronnie 2¢: Ronnie or Lilly? Ronnie for sure :)) Thanks very much! Cuando la vi por primera vez pense más bien en el cava... Una obra con mucha polémica, sobretodo por su precio. If that's the chicken wire, I don't want to see the size of the chickens! No la he visto en directo, solamente a través de fotografias, todas ellas parciales, esta es la primera en que aparece entero. Like twisted metal clothes hangers, strange, but interesting! Una abstracció escultural per a sos símbols del país! No sé si m'acaba d'agradar.... Bona nit! An amazing sculpture, well photographed. J'aime bien cette oeuvre "gros grillage". A nice shot of this interesting sculpture.